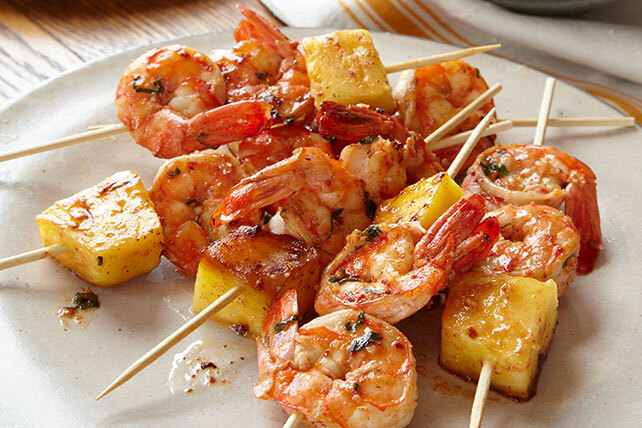 With a little sweetness and a touch of heat, these Pineapple-Shrimp Kabobs give you a taste of the Hawaiian Islands. Mix first 6 ingredients in medium bowl until blended. Add shrimp and pineapple; toss to evenly coat. Thread 2 shrimp and 1 pineapple chunk onto each of 12 skewers. Broil, 6 inches from heat, 4 to 5 min. or until shrimp turn pink. Cut off both ends of pineapple; place upright on cutting board. Remove peel by making lengthwise cuts from top to bottom of pineapple, working your way around pineapple. Lay pineapple on its side. Following the diagonal pattern of the eyes, remove eyes by making shallow v-shaped cuts in pineapple. Cut pineapple crosswise into 1-inch-thick slices. Remove core from each slice. Thaw frozen shrimp in the refrigerator, not at room temperature. Or, place the sealed package in a bowl of cold water and change the water every 10 min. until the shrimp are completely thawed.